Fascinated by Alberta's natural side, Megan loves to wander mountain passes and river coulees. Park interpreter turned freelance writer, she has penned hundreds of articles based on self-propelled adventures around the province with her husband, daughter, and canine companion. It’s easy to get stuck at the start, staring at the surreal blue of Moraine Lake backed by the Valley of Ten Peaks, about an hour’s drive west of Banff. It’s a scene so spectacular that it has graced the Canadian $20 bill twice in the past. Take another photo, a deep breath and pull yourself away – the rugged grandeur of hiking through Larch Valley and up to Sentinel Pass awaits. Larch Valley and Sentinel Pass in Banff National Park are classic Canadian Rockies hikes – and personal favourites. 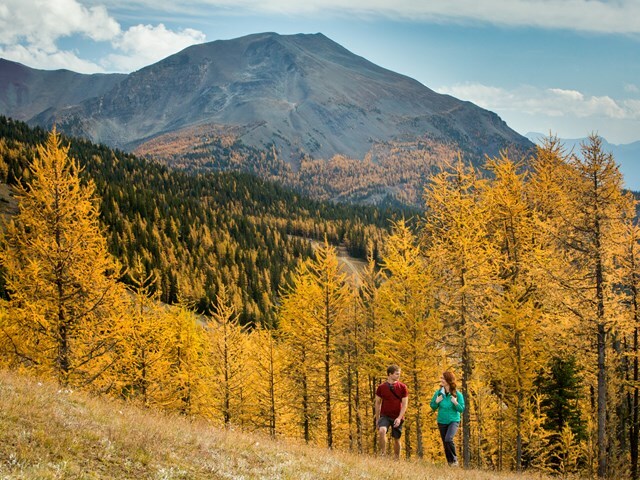 These three-season treks – access road is closed during winter – are unparalleled in autumn when the larch trees turns golden. Hundreds of hikers and photographers flood the valley every fall to soak up snow-capped mountain peaks punctuated with patches of brilliant gold among the evergreens. I’ve hiked the trail many times during the fall, but have to admit my favourite time to visit is summer. In late July, wildflowers are at their peak and fall crowds have yet to arrive. Marmots and ground squirrels romp through the alpine blooms. Grizzly bears are also known to use the meadows so, for safety reasons, minimum group sizes may be required. Stop in at the Parks Canada Visitor Centre in Lake Louise for up-to-date information – always a good idea when setting off on any hike. Don’t worry about having enough people before you arrive, there are always other hikers waiting at the trailhead to link up with a group. On one trip, we met up with a couple from British Columbia with similar hiking interests and the ensuing conversation completely took our minds off the initial uphill trek. The hike to Larch Valley and Minnestimma Lakes – small alpine tarns – begins at Moraine Lake and climbs up through the thick forest to the larch meadows. It’s a steady ascent with 535 m (1,755 ft) elevation gain over 4.3 km (2.67 mi) of trail. The round trip to here can take up to four hours – depending on how much time you spend soaking up the views. From the valley, it’s another 2.5 km (1.55 mi) and close to 200 m (656 ft) elevation gain on a switchback trail up to Sentinel Pass. Almost every time I’ve stood at the pass, it’s been windy. It’s a good idea to pack a windproof jacket in your backpack, but you can always hide out behind one of the rock walls built to block the breeze. I like sitting out in the open, snacks in one hand, water bottle in the other, as I gaze out over the unparalleled views. Take time to photograph the rocky spires off the pass – those silent namesake sentinels. If you look northward, you’ll see the backside of Mount Temple. The trail continues down the other side of the pass into Paradise Valley – but unless you have arranged a shuttle or dropped off a second vehicle to complete the circuit between the Paradise and Moraine parking lots, you’ll want to return the way you came.